The Federal Court has strict deadlines by which you must apply for judicial review. You must file an application within 15 days (in the case of a matter arising in Canada) or within 60 days (in the case of a matter arising outside Canada) after you were notified of the decision that you want to judicially review. Once this initial application has commenced, you have 30 days to file the Application Record, which will contain the legal arguments and evidence to support your case. The Minister’s counsel has 30 days to respond to this application. Judicial reviews are extremely complex and are usually argued by your lawyer. An individual may represent his or herself in a judicial review, but this is not recommended because of the legal nuances and complexities involved. Please note that immigration consultants are not allowed to appear before the Federal Court and cannot represent you in a judicial review. In the first stage, called the “leave stage,” the Court will review the submitted documents and arguments in your case. You must show the court that the original decision had errors in fact and/or law, and that the decision was not reasonable or fair. This stage proceeds entirely in writing. The Court may or may not grant “leave,” or permission for a hearing to hear oral arguments and to examine the decision in depth. If leave is given, the second stage of judicial review starts, called “Application for Judicial Review.” The court will schedule a oral hearing where your lawyer can explain why the original decision was wrong and should be sent back for another hearing. In some cases, a request for review by the Federal Court results in an automatic stay of removal, i.e. the removal order is on hold until the Court makes its decision. However, this does not apply to every person applying to the Federal Court. For instance, there is no automatic stay for DCO (designated country of origin) refugee claimants who are seeking judicial reviews. 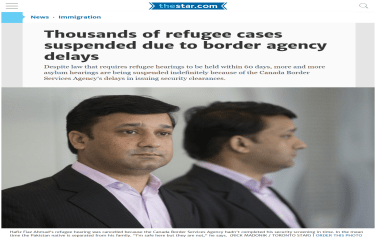 They must apply to the Federal Court for a stay motion to postpone their removal from Canada. If the court allows your application for judicial review, it will return your case for redetermination by a different visa or immigration officer or member of the IRB. The decision maker may consider any facts arising since the earlier decision was taken. Note that a judicial review is not like an appeal, in that the Federal Court cannot reverse or substitute a decision. If the judicial review is allowed, the original decision is set aside and the case is sent back to be redetermined by a different decision maker. If the Court rules that there was no error in a removal order made against you in Canada, you must leave Canada in 30 days.